Natural history collections are powerful tools for tracking environmental pollutants through time. Collections provide durable records of past environments and have been instrumental, for example, in tracking the rise of mercury contamination in the North Atlantic and linking insecticides to eggshell thinning and declines in bird populations. By leveraging collections to identify these patterns of environmental change, we position ourselves to address some of our most pressing environmental challenges. 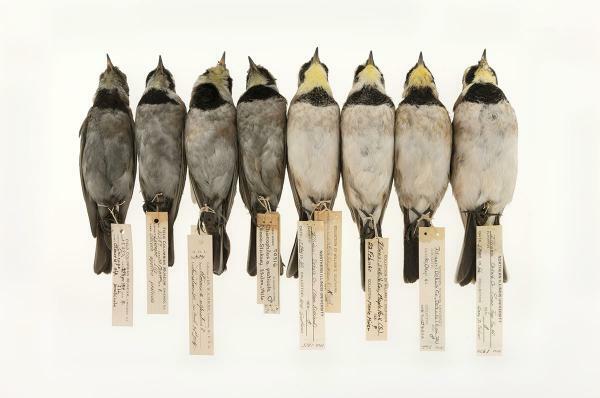 In a recent study, we uncovered bird specimens as an incidental record of atmospheric soot, also known as black carbon, a pollutant which has gained notoriety as a significant contributor to climate change. Black carbon is a byproduct of burning organic matter, like fossil fuels, and is a major climate-forcing agent. As such, historical emission inventories of black carbon are essential for assessing its effect on past and future climates. Inventories of black carbon, however, have high uncertainty worldwide for pre-1950s estimates because systematic air quality monitoring was non-existent before midcentury. By analyzing a time series of black carbon particles on bird specimens, we recovered historical estimates of atmospheric black carbon in the U.S. Manufacturing Belt from 1880 to present, filling a major historical sampling gap from a period when soot engulfed urban landscapes in the U.S. We find that prevailing emission inventories underestimate black carbon levels in the U.S. through the first decades of the 20th century, suggesting that black carbon’s contribution to past climate forcing may also be underestimated. From this initial work, a number of follow-up questions have emerged, which we have begun to work on. First, this dataset can be naturally expanded to encompass other regions of historical interest, like the British and Irish Isles, where we can evaluate the spatial and temporal extent of soot pollution further back in time. Second, we initially used specimens as a tool to recover historical estimates of soot pollution, but how did soot directly impact wildlife? For example, what are the evolutionary and ecological consequences for communication in birds when important plumage traits are covered in soot, obscuring plumage signals? Taken together, these projects leverage natural history collections to understand the consequences of human actions on the world around us.